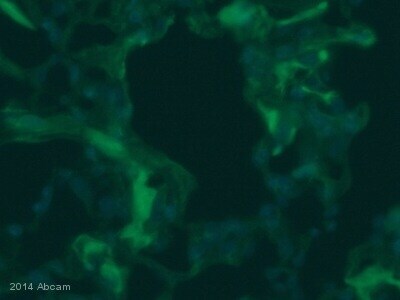 Mouse monoclonal pan Cadherin antibody [CH-19]. Validated in WB, IHC, ICC, Flow Cyt, ICC/IF and tested in Mouse, Rat, Rabbit, Goat, Chicken, Guinea pig, Hamster, Cow, Cat, Dog, Human, Pig and more. conjugated to KLH, corresponding to amino acids 889-912 of Chicken N-Cadherin (cdh2). This antibody can be used as a marker for the plasma membrane in cells which express cadherins - see reviews. This product is useful for the detection of members of the cadherin family or genetically engineered proteins containing the C-terminal cadherin tail, and for demonstration of adherens type cell-cell junctions regardless of their cadherin type. Our Abpromise guarantee covers the use of ab6528 in the following tested applications. WB 1/1000. Predicted molecular weight: 125-140 kDa. Cadherins are members of a multigene family of single chain glycoprotein receptors mediating calcium dependent cell-cell adhesion. 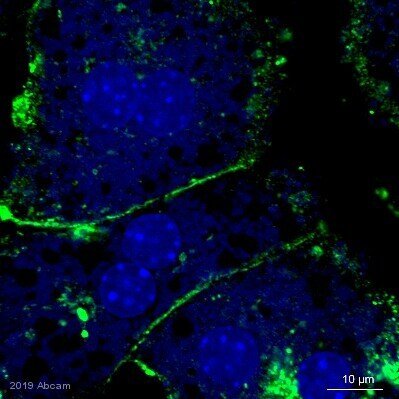 They play an important role in the growth and development of cells via the mechanisms of control of tissue architecture and the maintenance of tissue integrity. Cadherins are expressed in a tissue specific manner and and are required for assembly of cells into solid tissue. Individual cadherin molecules are known to co-operate with each other to form a linear cell adhesion zipper. In adhesion junctions cadherins are bound to beta and gamma catenins which in turn bind to alpha catenin, an actin binding protein. Cadherins play an important part in tumor invasion and metastasis. reveals the expected highly specific membranous distribution. for 5 minutes, blocked with 5% milk / 0.2% tween for one hour. carried out at 37 degrees C.
ab6528 (1/1500) positively staining cadehrin in mouse kidney tissue sections, as secondary antibody goat anti mouse biotin conjugated was used. Please see accompanying abreview for additional information. Overlay histogram showing HeLa cells stained with ab6528 (red line). The cells were fixed with 80% methanol (5 min) and then permeabilized with 0.1% PBS-Tween for 20 min. The cells were then incubated in 1x PBS / 10% normal goat serum / 0.3M glycine to block non-specific protein-protein interactions followed by the antibody (ab6528, 2µg/1x106 cells) for 30 min at 22ºC. The secondary antibody used was DyLight® 488 goat anti-mouse IgG (H+L) (ab96879) at 1/500 dilution for 30 min at 22ºC. Isotype control antibody (black line) was mouse IgG1 [ICIGG1] (ab91353, 2µg/1x106 cells) used under the same conditions. Acquisition of >5,000 events was performed. Madin Darby Bovine Kidney (MDBK) extract was separated on SDS-PAGE and probed with ab6528 at 1:2000. The antibody was developed with HRP Mouse Fab ads/HIgG conjugate and a NBT/BCIP substrate. 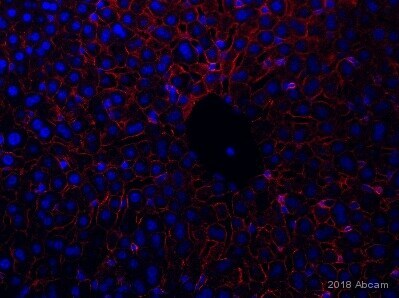 Ab6528 positively staining formaldehyde fixed HEK 293 cells at 1/200 in conjunction with goat anti mouse (Alexa 546) 1/1500. This image is an edited version of an image received courtesy of an Abreview submitted by Kun Liu on 19 September 2005. We do not have any further information relating to this image. Observed band size: 135 kDa why is the actual band size different from the predicted? Gel running conditions are denaturing and 10% SDS. Blocked using 5% milk for 30 minutes at 25°C. 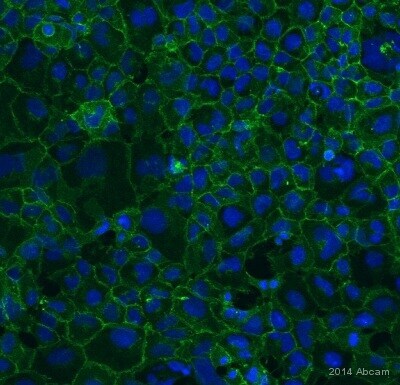 ab6528 staining pan Cadherin in mouse Cor1 cells by Immunocytochemistry/ Immunofluorescence. Cells were fixed with formaldehyde, permeabilized with TBS, BSA, azide and Triton and blocking with 1% BSA for 30 minutes at RT was performed. Samples were incubated with primary antibody (1/1500: in TBS, BSA, azide and 0.3%Triton) for 2 hours. 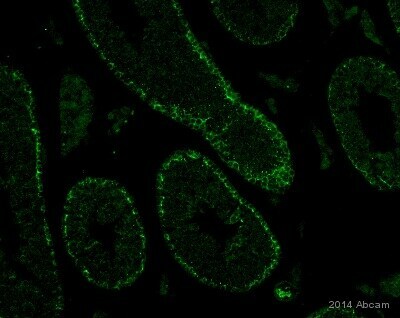 An Alexa Fluor®546-conjugated goat polyclonal to mouse IgG was used as secondary antibody at 1/1000 dilution. 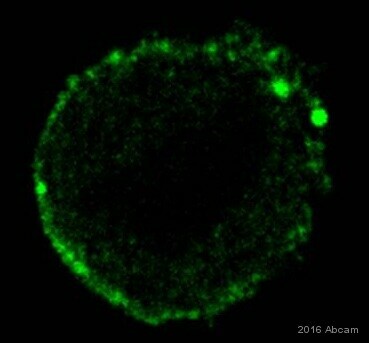 The image was captured using Z-stacks/Zeiss Apotome microscope rig. Publishing research using ab6528? Please let us know so that we can cite the reference in this datasheet. Hello, would this antibody work on viable, unfixed and not permabilized cells to stain the plasma membrane of CHO cells? The pan-cadherin antibody ab6528 is raised against a cytoplasmic sequence of chicken cadherin 2 (CDH2) which is conserved in Chinese hamster cadherins. So, although it will be capable of detecting CHO cadherins, detection in cells will require fixation and permeabilization, as the antibody needs to cross the plasma membrane to reach the intracellular sequence. Yes - 0.1% Triton-X (5min, RT).